United Technologies, Ingersoll-Rand, and Allegion are all attractive stocks for investors looking for exposure to commercial construction growth. With optimism high for an infrastructure stimulus, ongoing strength in the residential sector, and improving industrial production in the U.S., expectations for a strong commercial construction market in 2017 are well founded. But which stocks to buy? United Technologies Corporation (NYSE:UTX), Ingersoll-Rand (NYSE:IR), and Allegion (NYSE:ALLE) are attractive stocks for investors looking for exposure. Here's why. You may already know the long-term case for buying stock in United Technologies. Essentially, the company's key end markets are aerospace (Pratt & Whitney and aerospace systems segments) and construction (Otis elevators and the climate, controls and security [CCS] segments). The two construction-related segments were responsible for 57% of total segment operating profit in 2016. Looking into 2017, an improving global and U.S. commercial construction market would benefit the company in a number of ways. For example, management's main focus with Otis is to increase equipment market share in order to drive long-term services revenue. It's doing this in two main ways: being more price competitive and releasing new products. Clearly, any kind of improvement of demand in China -- the largest elevator market in the world -- would alleviate new equipment pricing pressure on United Technologies while helping it to successfully roll out new products. Meanwhile, CCS is also launching new heating, ventilation, and air conditioning (HVAC) products, and management is hoping to regain market share with them. In fact, it expects organic sales growth in the low single digits for CCS in 2017. Given that HVAC products are infrequently updated, it could be an opportune time for United Technologies' Carrier to grab new equipment sales. Ultimately, if management successfully positions the company for long-term growth, then the stock's current discount to its peers will close soon enough. UTX EV to EBITDA (TTM) data by YCharts. One of Carrier's main competitors is Ingersoll-Rand's Trane, and the ongoing margin improvement at the air-conditioning company is the key argument for buying Ingersoll-Rand stock. I've previously made a more comprehensive case for buying the stock -- suffice it to mention here that the transformation at Trane has helped to improve profitability and free cash flow (FCF) generation, while at the same time generating above-industry revenue and order growth. As you can see below, across a raft of key operational metrics, Ingersoll-Rand's performance has improved -- despite Trane carrying an ailing industrial segment, which saw operating income drop 21% in 2016. As illustrated below, on an enterprise value (market cap plus net debt) to earnings before interest, tax, depreciation, and amortization (EBITDA) basis, it's even cheaper than United Technologies. 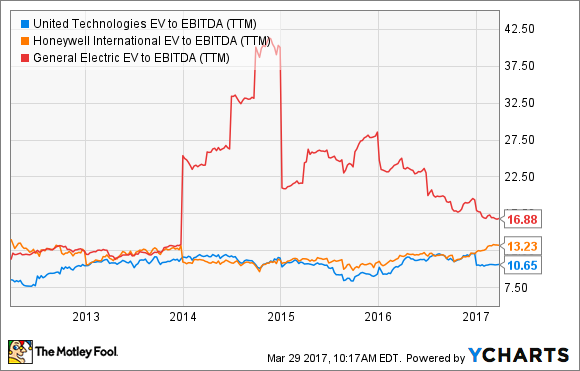 IR EV to EBITDA (TTM) data by YCharts. The final company isn't superficially a cheap stock, but it does offer long-term growth prospects in a world of moderate growth. 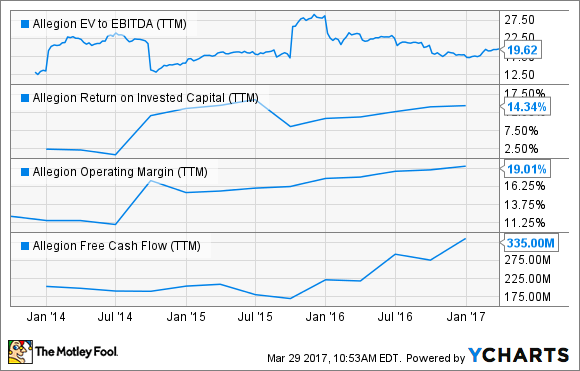 As with Ingersoll-Rand, security products and solutions company Allegion has been improving its key operational metrics in recent years, but its valuation looks stretched, particularly when compared with those of United Technologies and Ingersoll-Rand. 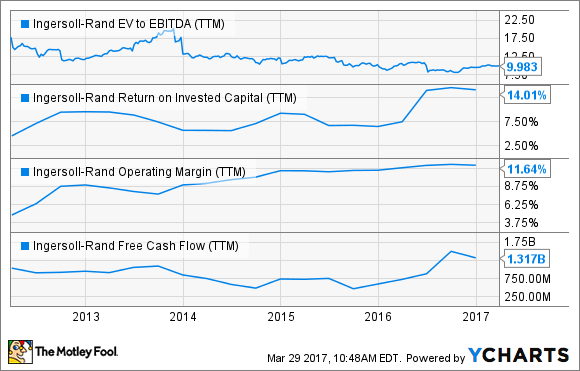 ALLE EV to EBITDA (TTM) data by YCharts. On the other hand, Allegion offers double-digit earnings growth prospects amid significantly improving FCF generation. You can see analyst estimates for adjusted earnings per share in the table below. As for FCF, Allegion generated $335 million in 2016 (see chart above) and $300 million to $320 million in 2017, but this is including a $50 million pension contribution. In other words, underlying cash flow generation is strong. The key to Allegion's superior growth prospects lies in the convergence of mechanical and electro-mechanical security solutions. Allegion's door locks increasingly include wireless and Web-enabled technologies that provide many benefits to commercial customers. For example, companies can configure the locks to allow and deny entry, all the while monitoring usage, with the end result being enhanced security. Management expects these products to open up new markets and come with a higher average sales price per unit, both of which will likely drive revenue and earnings growth in the future. All told, these three companies are attractive in their own right, and will be key beneficiaries of any improvement in the commercial construction sector in the coming years. United Technologies offers value as it goes through a transition period, while Ingersoll-Rand and Allegion have both made significant operational improvements. The latter, in particular, boasts strong secular growth prospects.